Born in Vecchiano (Pisa) November 21, 1969, Andrea obtained a high school diploma from the Lucca Institute of Art and continued his studies at the Academy of Fine Arts in Florence. He mastered his skills with antique furniture restoration courses and painting restoration classes with Professor Migliorini. In addition, he attended several gilding courses in Pisa. His first artworks as sculptor date back to the ’90s: painting the baptismal font in the church of Castiglioncello (Lucca), making the liturgical furnishings for the church of Pontasserchio (Pisa) and restoring a wooden sculpture in the church of Balbano and Castiglioncello (Lucca). A passion for antiquity combined with a fascination for sacred art made him commit full-time to marble sculpture. Attending the Lapis Studio in Pietrasanta and collaborating with Cave Michelangelo and Giannoni Ulderigo Art Studios, drove him towards a full creative development that translated in unique artworks made in the Atelier of Pietrasanta on behalf of several Italian and foreign customers. He is in charge of the statuary art division of the project Ars Ecclesiae. 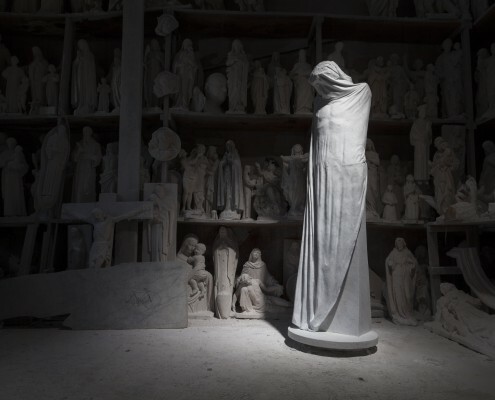 In the sculpture Atelier, which is part of the network of Pietrasanta and Carrara, he shapes statues’ models in clay, then reproduces them in marble. The Atelier hosts a plaster cast gallery with hundreds of religious art sculptures. Alongside and together with the Studio, the reality of the “bottega” stands out: a solution designed for young sculptors and anyone who wants to experience the opportunity of an independent job. It is an quipped, multifunctional space, a place for training, interaction and exchange, that supports the local manifold art landscape. 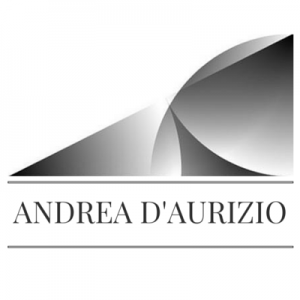 Andrea considers art as an irrepressible instinct, a necessity, a vocation … An intimate quest for identity, truth and beauty that, due to its nature, is to be found in the non-discursive. Art is perceived as a mystical experience that goes beyond time and tries to materialize. He likes to think of his job as that of a Renaissance sculptor who, from the bottega, runs the gamut from theoretical study through project elaboration all the way to completing the work. Pisa Young Artists Biennial: participation in an event held at Palazzo Lanfranchi, Pisa. Jubilee: arwork for a traveling exhibition which gathered 30 artists including painters and sculptors. G.A.I. Young Italian Artists: selected within the contemporary art network at the gallery of the Saint of Padua. Young Artists Biennial: participation in an event organized at Ex Stazione Leopolda, Pisa. “Quotidiana 2001”: participation in the exhibition of the “Young Italian Artists Archive”, orgnized by Virginia Baradel, Guido Bortorelli, Stefano Schiavon at the Museum of the Saint of Padua. Workshop in Pietrasanta: creation and management. “Sea, Industry, Marble”: participation in a sculpture symposium held in Massa organized by Ezio De Angeli, after which the public artwork “Under the Wave” was designed. “Koiné”, Vicenza: participation in an international event of sacred art. “Assisi Sacred Art”: participation in an exhibition at the Palazzo del Monte Frumentario, Assisi. “Nativity Art”: participation in an exhibition, Loreto. “The Stele of Peace”: public work designed and placed inÂ Parco della Pace in Pontasserchio (Pisa), during the 150th anniversary of the Italian Unification. XXV Eucharistic Congress, Ancona: participation in an exhibition of Sacred Art. Koiné, Vicenza: participation in an international event of Sacred art. Koiné¨, Vicenza: participation in an international event of Sacred art. Reproduction of the Sarcophagus from I/II sec. A.D. placed in the Pieve di Santo Stefano of Camaiore, in permanent exhibition at the Archaeological Museum of Camaiore.